LAUSANNE, Switzerland (AP) — After the extreme stress test of a years-long Russian doping scandal, the World Anti-Doping Agency will get a new leader this year while still rebuilding trust with athletes. The six-year presidency of IOC member Craig Reedie began with the steroid-tainted Sochi Olympics and will end in November with likely dozens of Russian doping cases unresolved in the ongoing fallout. "This has been a complicated period," Reedie acknowledged Wednesday on the sidelines of WADA's annual hosting of anti-doping experts in the Olympic family's home city. WADA has been hit from all sides during what the Scottish official described as "one of the biggest political stand-offs in world political affairs" of recent years. Still, Reedie believes he hands over an organization that "comes out of it with very substantial credit, and if some of that bounces back on me then I will be happy to take it." The next WADA president will be picked by the public authorities, which jointly fund the global anti-doping watchdog, and take turns holding the presidency with the Olympic movement. Europe nominated Poland's sports minister, Witold Banka, and the Americas proposed Marcos Diaz of the Dominican Republic. Both former athletes are members of WADA's executive committee. A third candidate is Linda Helleland, the WADA vice president and its most vocal critic of Russia. The Norwegian lawmaker remains in the race without a formal nomination. All three candidates were at the WADA conference Wednesday, though no campaign event was held with key stakeholders from laboratories, anti-doping agencies, athlete groups and sports governing bodies. Reedie would not speculate on how the job has evolved in his time, but added: "I am sure a new president will have his own priorities." Poland's 34-year-old sports minister entered politics after a career as a world-class runner. He got a bronze medal in the 4x400-meter relay squad at the 2007 world championships. He recalled how his Polish relay colleagues were denied gold medals at the 1999 worlds by "some cheaters" among the United States quartet which was later stripped of the title. He said he would create a solidarity fund to help pay for more testing laboratories, especially outside Europe. Asked about the Russian case, he pivoted to suggest "we are forgetting about anti-doping blank spots." Banka said almost 10 percent of the medals from the 2016 Rio de Janeiro Olympics — 306 events in total — went to countries with a "very weak anti-doping system." "For my opinion, this is the biggest problem," he said, noting there is just one WADA-accredited laboratory in Africa. It is in Bloemfontein, South Africa. "We should have equal treatment for all countries. Russia, Poland, USA, all European countries (should) respect the rules," he said. The former marathon swimmer is president of CADE, the pan-American group of government sports ministries. 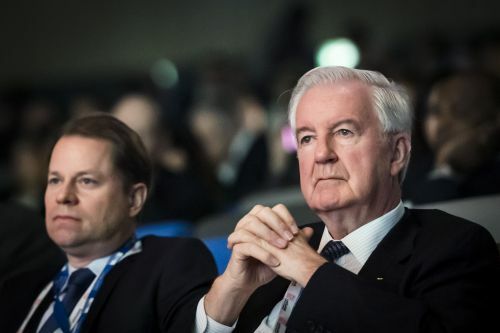 WADA has had three white, male presidents from Anglo-Saxon countries since it was created in 1999. Now, Diaz believes it is time for a leader from "not only the Americas but a third-world country." "Leaving that part of the world behind creates doping havens," he said. Diaz cited work to rebuild links with the IOC. Like Banka, he voted on WADA's ruling committee to reinstate Russia's anti-doping agency last September before the country met the mandatory conditions laid down. He suggested Helleland could step aside before a May 14 meeting of WADA's public authority delegates choosing the next president. Then, in Montreal, they hope to find a consensus candidate who will shadow WADA leaders before formally replacing Reedie at a Nov. 5-7 conference in Poland. Asked about Helleland finding a late nomination proposal, Diaz said: "Will a country do that and break the gentlemen's rule? I hope not." Running against two former athletes, Helleland is the candidate pressing hardest to include athletes in decision making. "It hurts me that they tell us they lost trust in anti-doping," said the former minister for children and equality from Norway's conservative party. Helleland's public questioning of an apparent rush to reinstate Russia last year riled influential people in the Olympic establishment while gaining respect from many athletes.